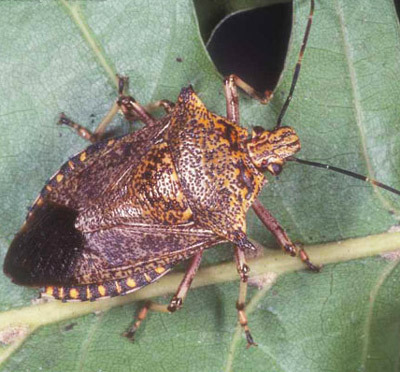 Alcaeorrhynchus grandis (Dallas), sometimes called the giant strong-nosed stink bug, is a very large (20 mm) predatory stink bug which occurs in several row crops and preys on other insects, especially lepidopterous larvae. The stages in the life cycle are presented here so that they can be identified in the field. Figure 1. Adult predatory stink bug, Alcaeorrhynchus grandis (Dallas). Photograph by Lyle J. Buss, University of Florida. Alcaeorrhynchus grandis has been reported from Brazil, Colombia, Mexico, and the southern United States (Ribeiro et al.). The Florida State Collection of Arthropods has several specimens collected in 1973 through 1975 at Edgard and Prairieville, Louisiana by Vernon Brou. Florida records are from the entire peninsula and at least as far west and north as Jackson County. Alcaeorrhynchus grandis was reared in the laboratory by Richman and Whitcomb (1978). At variable temperatures averaging 26°C and at a constant temperature of 27°C (both at 14:10 photoperiod) the time from egg to adult lasted 59 to 60 days, with the egg stage taking 15 to 16 days. Adults: The length of the adult male is 16–21 mm, with the humeral width 9–12 mm (including spines). Adult female length is 18–25 mm, while the humeral width is 11–14 mm (including spines). The adults have double spines on the humeral angles. The adults of Alcaeorrhynchus grandis are variegated brown in color, with dark bands on the legs and dark maculations along the dorsolateral margins of the abdomen. 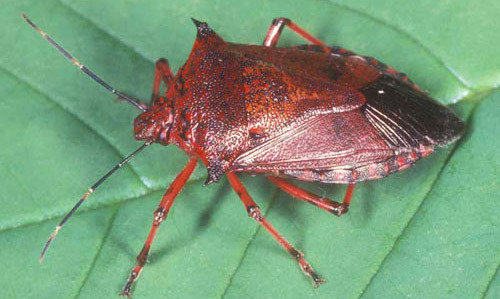 They are the largest predatory stink bugs in Florida and generally resemble Podisus maculiventris (Say), from which they can be distinguished by their larger size and double, rather than single, humeral spines. Figure 2. 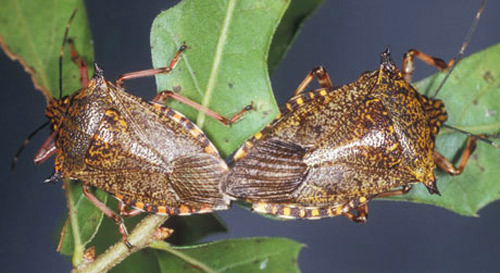 Mating adults of the predatory stink bug, Alcaeorrhynchus grandis (Dallas). Alcaeorrhynchus grandis adults have double spines on the humeral angles. For example, notice the right humeral spines on the adult on the right, one of which is longer and more pointed than the other. This is a key identifying characteristic. Photograph by Lyle J. Buss, University of Florida. Figure 3. Adult predatory stink bug, Alcaeorrhynchus grandis (Dallas), with an unusual red coloring. Photograph by Lyle J. Buss, University of Florida. Figure 4. Adult predatory stink bug, Podisus maculiventris (Say). Not only is this predatory stink bug much smaller than Alcaeorrhynchus grandis (Dallas), but notice the single-spined humeral angle. Photograph by James Castner, University of Florida. Eggs: Approximately 1 mm in diameter, with short projections around operculum. They are laid 100 to 200 at a time in multiple row masses. On soybean stems these masses are usually four to five rows wide, but may be up to 10 rows wide on paper toweling in the laboratory. Figure 5. Eggs of the predatory stink bug, Alcaeorrhynchus grandis (Dallas). 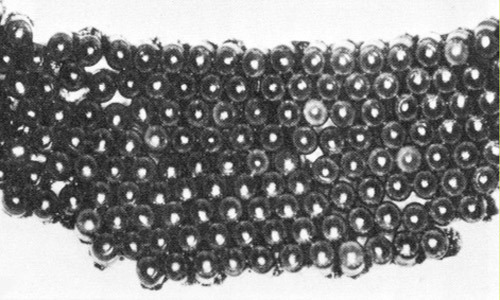 Photograph by Division of Plant Industry. 1) first instar, 2) second instar, 3) third instar and 4) fourth instar. Photograph by Division of Plant Industry. 1st instar. The length is approximately 1.5 mm and the humeral width is 0.9 mm. 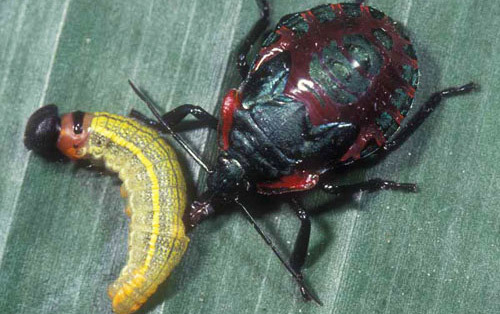 These are difficult to distinguish from the first instar nymphs of Euthyrhynchus floridanus (Linnaeus) as both have a blue-black head and thorax and red abdomen with dark central and lateral "stripes" composed of dorsal and lateral dark colored plates. Nymphs of this age do not stray far from the egg mass and may be distinguished by the form of the mass and numbers of eggs, whereas Euthyrhynchus floridanus egg masses are loosely oval and contain 20 to 90 eggs. 2nd instar. The length is approximately 3 mm while the humeral width is 1.3 mm. 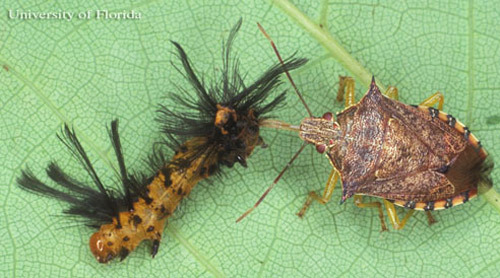 Alcaeorrhynchus grandis begins to capture insect prey in the 2nd instar. 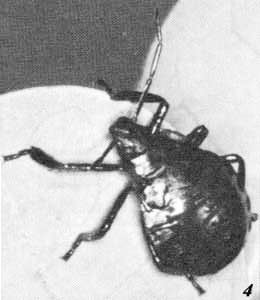 At this stage the nymph has differentiated somewhat from the color of the 2nd instar nymph of Euthyrhynchus floridanus and has become more uniformly brownish with faint markings on the abdomen. 3rd instar. The length is 4–5 mm and the humeral width is 2.3 mm. 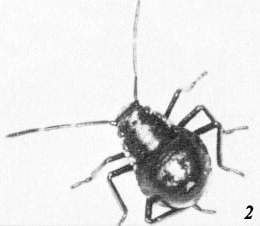 At this stage the nymph has acquired red lateral keels on the pronotum and is generally bluish-black with a brownish abdomen. 4th instar. The length is 7–8 mm while the humeral width is 3.8 mm. 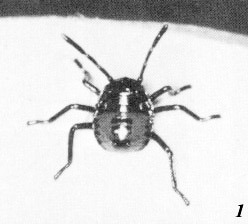 The 4th instar nymph has larger red lateral keels on the pronotum. 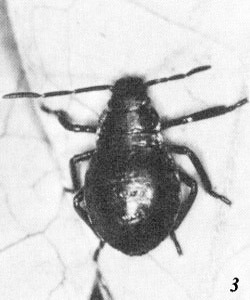 The general color of the nymph is bluish black. The wing pads are visible, but not prominent. 5th instar. The length is 10–14 mm while the humeral width is 6.5 mm. The 5th instar nymph has distinct wing pads and very large red lateral keels on the pronotum. Figure 7. Fifth instar nymph of the predatory stink bug, Alcaeorrhynchus grandis (Dallas), with distinct wing pads. Photograph by University of Florida. Figure 8. 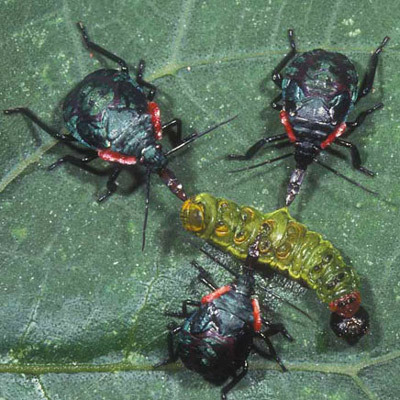 Nymphs of the predatory stink bug Alcaeorrhynchus grandis (Dallas) exhibiting group predatory behavior by jointly attacking a bean leafroller caterpillar.Photograph by University of Florida. Although little has been written on this species, it has been reported to be an important predator of soybean pests in Florida (Watson 1916, Whitcomb 1973). It has also been reported to be a pest on eggplant (Watson 1922), but damage to any crops by this species is probably exceptional. Watson JR. 1916. Control of the velvetbean caterpillar. Florida Agricultural Experiment Station Bulletin 130: 45-58. Richman DB, Whitcomb WH. 1978. Comparative life cycles of four species of predatory stink bugs (Hemiptera: Pentatomidae). Florida Entomologist 61: 113-119. Watson JR. 1922. Report of entomologist. Pages 56R-59R In Newell W. Agricultural Experiment Station Report for the fiscal year ending June 30, 1922. University of Florida, Gainesville. Whitcomb WH. 1973. Natural populations of entomophagous arthropods and their effect on the agroecosystem. Proceedings of the Mississippi Symposium Biological Control, University Press of Mississippi. p. 150-169. Authors: David B. Richman, University of Florida, and Frank W. Mead (retired), Florida Department of Agriculture and Consumer Services, Division of Plant Industry. Originally published as DPI Entomology Circular 192. Publication Date: October 2000. Latest revision: August 2014. Reviewed: December 2017.